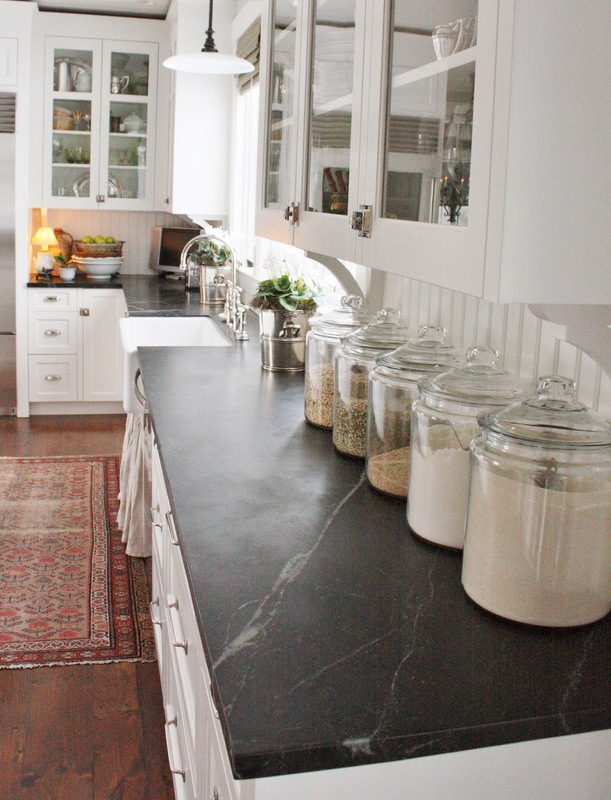 Counter space is some of the most precious real estate in your entire house. Not only do you need room to cook, but often counters act as extra storage for everyday tools and ingredients. Here's how to stretch every inch out of them, while creating a kitchen that look stylish, too. If you're an avid baker who enjoys having easy access to her sugars and flours (or a stretched-thin mom who needs to be able grab Cheerios, stat), it's OK to devote some counter space to non-perishables. But leaving them in their original packaging is just asking for a cluttered look. Joan at For the Love of a House decanted ingredients into elegant glass jars for an airy feeling, but opaque stainless canisters (like these) can lend themselves to a look that's even more tidy. 2. Group like items to create a cohesive, intentional feel. Marian at Miss Mustard Seed practices smart storage and clever design by layering cutting boards against her backsplash, and using a pretty white serving tray to corral large utensils, spices, and olive oil. When you'd prefer to devote a portion of your counter to tools you grab often, a tray can magically take the space from busy to neatly decorated. 3. Treat your drawers to some helpful organizers. When counter space is limited, make drawers and cabinets more useful (and more enticing to use), by souping them up with clever storage solutions. Items like an in-drawer knife block orspice rack can find a new, helpful spot for stuff that previously only lived on the counter. They'll still be easy to grab, but you'll free up much-needed prep space. 4. Try a towel bar. This simple solution takes major advantage of a portion of your counters you probably rarely consider: the sides. Janette, the blogger behind The 2 Seasons, shows that installing this bathroom staple is easy, and with a few S-hooks, it's the perfect for hanging pots and pans (which look quite lovely displayed this way, too). Bonus: The bars come in a wide range of finishes so matching your décor is a snap. 5. Park a cake stand by the sink. In a totally genius move, blogger Liz Marie elevated sink-side soaps and dishrags onto a cake stand (with a cute bin, to boot!). The stand adds a pretty touch, and makes the counter double-decker, so cleaners aren't always in the way. 6. Choose a cute toaster. Storing appliances you use every day can be a big pain, so if you must devote counter space to a blender or toaster oven, make sure it's one you like looking at. If it's got a pleasing color or shape, you'll be more likely to keep it (and its surrounding area) clean and tidy. 7. And pick utensils to match. While you're at it, if you store ladles, spatulas, and other tools in a canister near the stove, choose versions that look good in a group to create a put-together feel, even when they're not. Bonus points if you can get your favorite tools to also match your countertop appliances; there's nothing that says "neat and stylish" quite like monochrome. 8. Make your backsplash work harder. Magnetic knife holders aren't a new idea, but don't discount their sleek design as well as their storage sense. A repurposed curtain rod or towel bar can hold and display your graphic mugs and towels (like Anna did at Door Sixteen). Or, go all out and fill your backsplash with pegboard, for a crafty-chic look that doubles as super-flexible storage.